A memorable rearguard performance saw WIFC secure a third successive IFA London Cup Final berth, as they edged past a very hard working Gillingham side with a 3-2 win in Kent on Saturday. The Internet ‘Orns took the lead after ten minutes, when Ally Hill’s near post glancing header made sure a goal-bound Rob Sterry corner crossed the line. The lead was extended against the run of play midway through the half, when Ally Hill again headed towards goal only for the ball to strike the upper arm of a defender. Rob Sterry blasted home from the spot to double the lead. 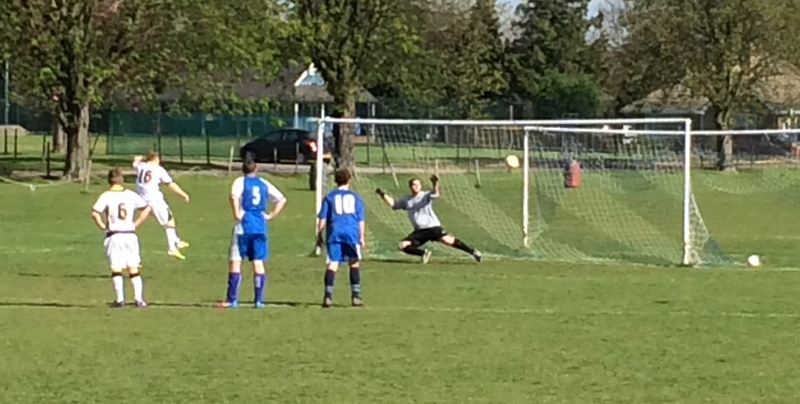 Rob Sterry dispatches the first of his two penalties. Neither side were creating much but Gillingham were making far more of their possession in midfield and they pulled a goal back with a soft penalty given by the referee with no claims from the Gillingham lads. 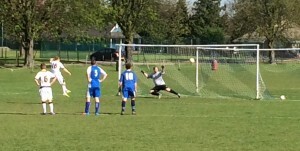 Richard Walker nearly kept the ball out diving the right way but the placement was too good and it was 2-1 at half time. Gillingham made the most of the wind and slope in the second half and threw everything at the WIFC back line. The visitors defended doggedly, but with ten minutes to play, one bounce too many allowed Gillingham to pull level with a close range header. Gillingham had the best chance to take the game when they finally got the best of the WIFC back line to break through, but drove the ball wide of the far post. With 5 minutes to play, WIFC sent a free kick deep towards the Gillingham box and Martin Pollard was pushed in the back for a hotly disputed penalty. Sterry again send the keeper the wrong way, for his second. The Gills fans pushed hard in the last few minutes but resolute defending from WIFC kept any chances to a minimum and sent them through to a repeat of the 2012 final against West Ham. Manager Chris Davis was delighted at the final whistle. “Very hard work was the order of the day and to come through shows the massive steps we have taken. A particular mention to the subs, 2 of whom didn’t get on, your support on the sideline was great and makes it easy when you can see bigger picture”. John Sitkowski was named man of the match, on a day when any of the defenders could also have scooped the award. Team. Richard Walker; Richard Wenham, Ally Hill, Martin Pollard, Sam Copeland; Richard Murphy, Rob Stone, John Sitkowski, Jimmy Davis, Joel Moody; Rob Sterry. Subs Andy Myall, Phil McBride, Matt Ainsley, David Sitkowski, Tom Beck.